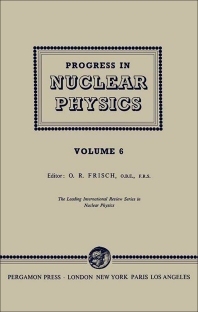 Progress in Nuclear Physics: Volume 6 is a collection of scientific papers in the field of experimental and theoretical physics. The compendium contains research papers covering a wide and diverse range of subjects in various areas of physics. The book provides contributions that discuss the methods for measuring atomic masses; the preparation of pure or enriched isotopes through electromagnetic separators; the study of nuclear moments; the spectroscopy of mesonic atoms; and parity nonconservation in weak interactions. Theoretical and experimental physicists will find this book very insightful.